California Sea Lion thoroughly in its element. 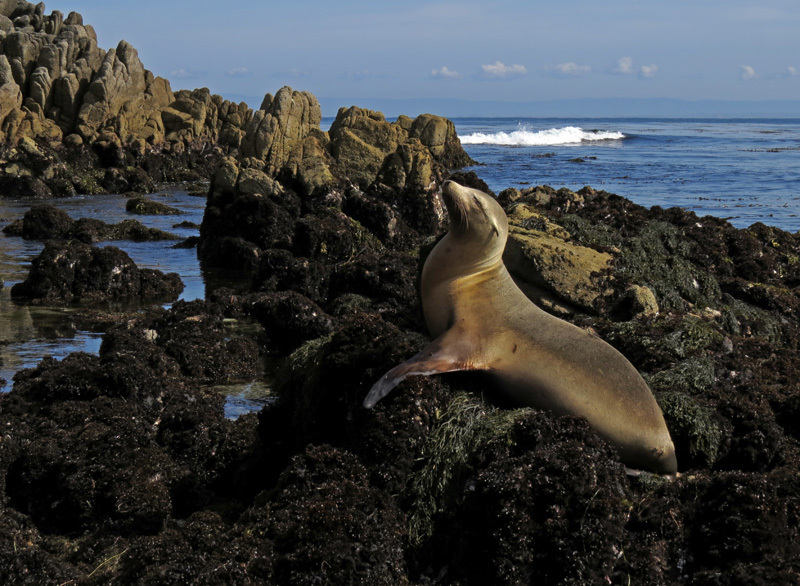 Photographed in Pacific Grove, California. Love shots like this that include a lot of environment. Very strong composition, really like the way the sea lion just fits into the scene (you were perfectly positioned). Looks like this may have been harsh lighting but you managed to get a nice balanced exposure out of it with great detail. Lovely composition with the inclusion of the habitat and I really like that the body line and head angle mimic the top line of the far rocks. Sweet detail and light add the finishing touches to this very nice image! I'm glad you like this shot. Pacific Grove and Monterey, California have especially beautiful coastlines and plenty of opportunities for environmental shots like this. Yes, the lighting was a bit challenging, to be sure. It was fun positioning myself without disturbing the sea lion. Patience, patience, patience! Thank you, Carol. It's a rare environmental shot from me since I really enjoy portrait captures! Those beautiful rock formations were pretty hard to ignore, though. Thanks for you generous comments, Paul. Glad you like my signature line. It makes all the difference when you can enjoy the wonderful company of your spouse and truly make it a team effort. We've been happily married for 36 years! Lovely comp and lighting Tony!